I know I haven't posted in a little while. My husband and I were so blessed to be able to take a cruise to celebrate our 30th anniversary so we were away for awhile. I can't believe that we have been married for 30 years. I cannot even tell you how wonderful those years have been. There is nothing like being married to your best friend. That is not to say that we haven't had our challenging times but with the Lord's help we have always come through them stronger as a couple and I am so grateful for that. I cannot imagine my life without this wonderful man in it. 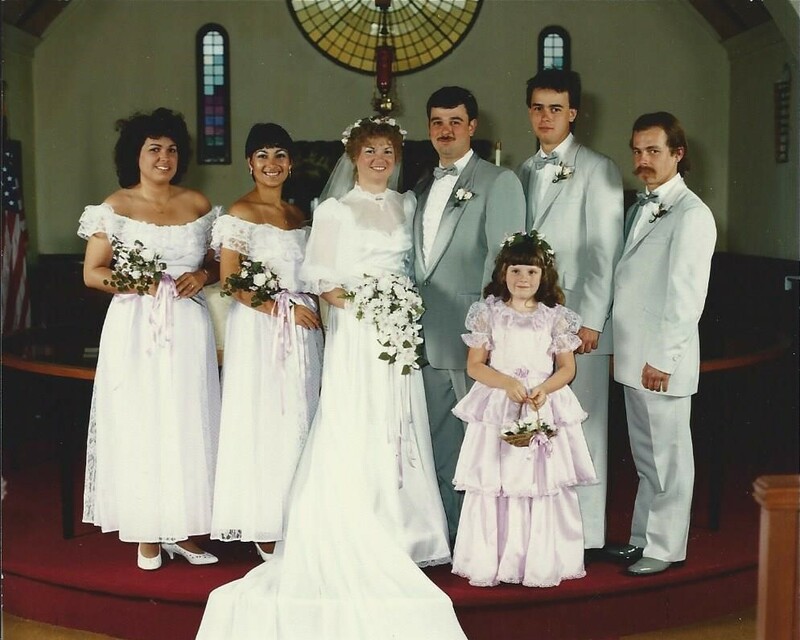 So now that you have had a little laugh at the "80s" wedding picture. It was windy that day and my poor hubby was suffering something terrible from his allergies. He really wan't crying about marrying me. My husband planned the entire trip just as he did for our 25th. 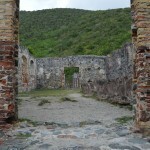 We visited the British Virgin Island of Tortola which was very rustic. They are just beginning to welcome cruise ships there. The people are wonderful and we got to ride to the top of their highest peak (1700') then hike for a mile around the top. 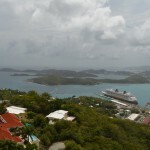 Then we spent a day at St Thomas and St John which are American Virgin Islands. Here are some fun facts. 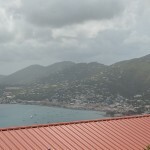 In Tortola they drive on the left side of the road but the currency is the American dollar. 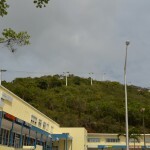 In St Thomas and St John they also drive on the left side of the road even though they are American territories. 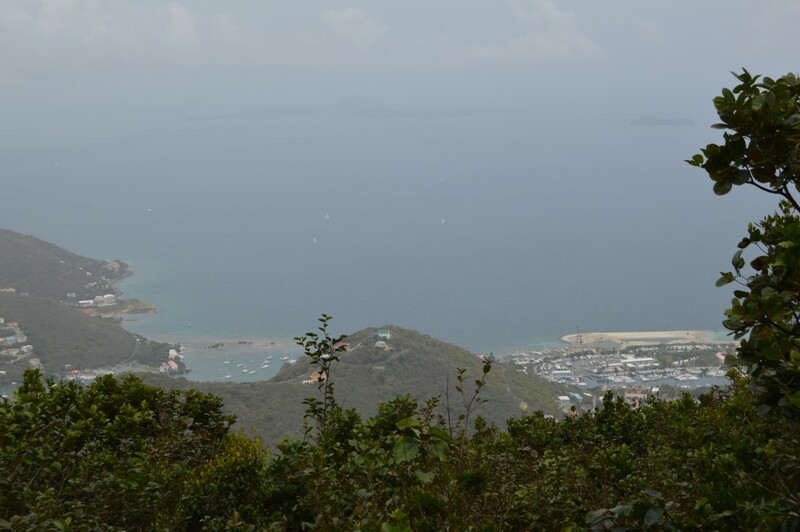 There is only about a distance of 20 miles or so between Tortola and St Thomas/St John so they are more related to each other than the countries who they are territories of. 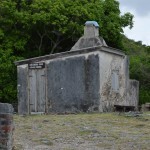 After we arrived at St Thomas we took a boat over to St John to explore there. 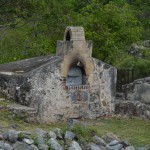 The island was known for it's sugar production. 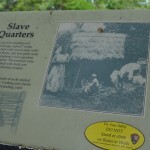 We visit one of the old processing plants where slaves were used to cut and work the sugar cane. The tall structure in the last picture was a windmill. 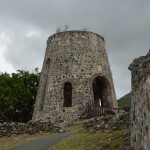 The top is gone now but when the wind blew it turned the crusher to get the juice out of the sugar cane. If the wind wan't blowing they used donkeys. 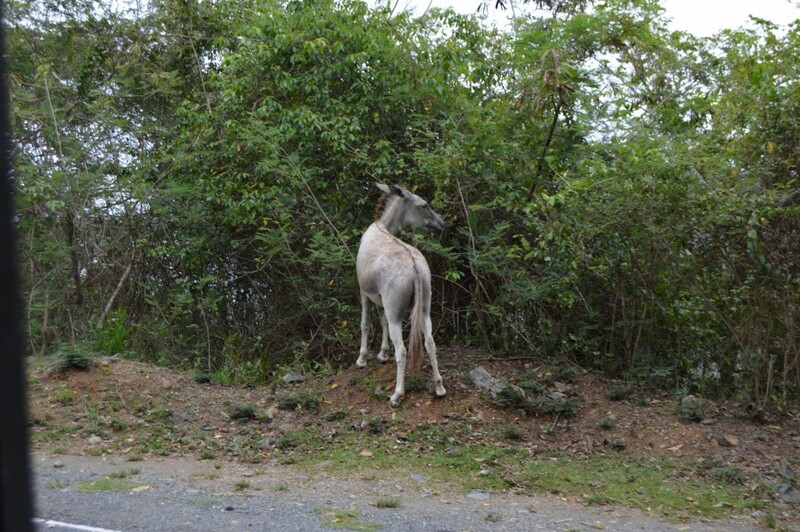 There are now feral donkeys running around the island that have come from the days of using them for the sugar cane. When we got back to St Thomas we had a couple of hours before we had to be back to the ship. They have a sky tram so we decided it would be fun to ride that. It gave us a great view from the top. There were a few little shops so we bought a couple of "island" things to bring home. Finally we stopped for the day at Disney's Private island, yes we took a Disney cruise, Castaway Cay. We rented bicycles and peddled all over the island. 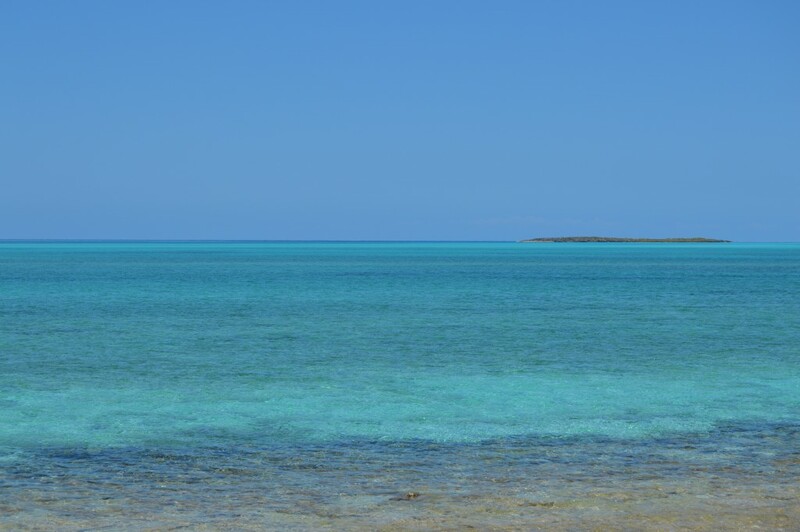 It is amazing how blue the water is in the Bahamas. The great thing about Disney is that although you think of kids when you think of them they do a lot for adults as well. There is a whole section of their ships that are for 18 and older so if you don't want to be where the kids are you don't have to be. The same thing applies to their island. We were on the adult side where they have a beautiful beach and this is what came walking up the white sand. 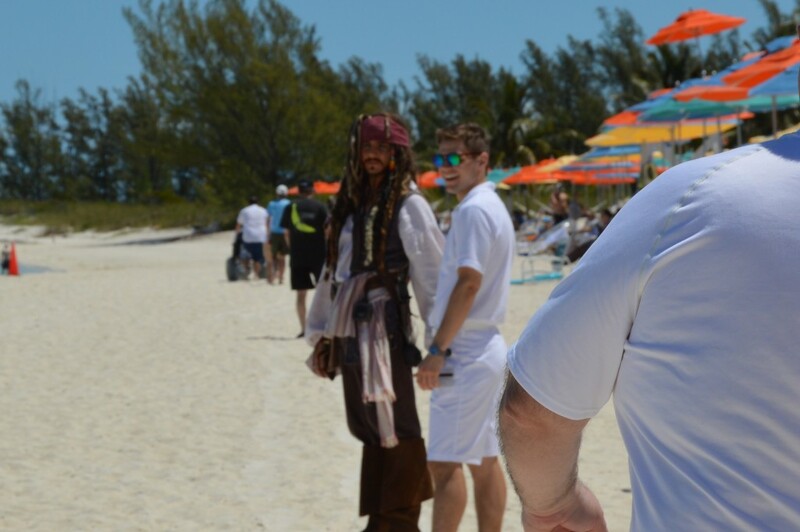 Yes, that is Jack Sparrow. The guy in white had to keep him from getting too out of hand. He was totally in character which was fun. He teased people, pushed them in their hammocks and rolled an inner tube down the beach. It was a really relaxing day. 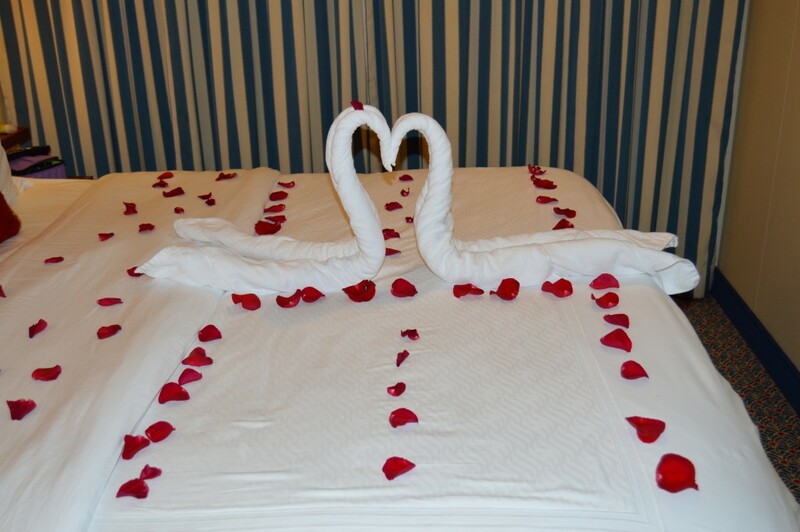 When we got back to our stateroom our hostess had decorated for our celebration. Those are even real rose petals. We were very blessed to have a young lady be able to stay at the homestead and take care of the chickens,dogs and cat so that we were able to take this memorable trip. Homesteading takes a lot of time and effort but sometimes you just have to take a little time away. Well, we finally had a warm enough day to get the barn mucked out from the winter. We do a good cleaning when it starts to get cold in the fall. From there on out throughout the winter we just keep adding shavings as needed to keep a clean surface for the chickens. Over the years we have found that leaving the shaving and chicken manure in the coop over the winter actually creates a little heat for the birds. I'm guessing that even though it is cold there is a little composting going on with the various layers of materials. Since most of our compost is made up of what we clean out of the barn and those things are seasonal we keep several piles going at a time. Each year there is a new pile created and we work on about a 5 year cycle. That means that we have five piles going at once. 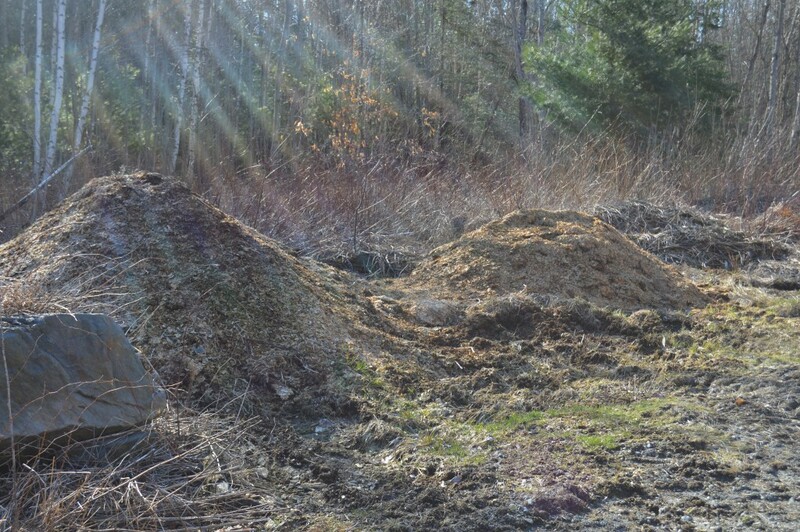 We have a spot on the property where the piles are lined up along the woods road. It is pretty easy to tell which is the new pile because it is the lightest in color. These in the picture are ready to be turned. During the winter the piles just sit and do their thing because there is no bucket on the tractor we cannot turn them but once we take the snow plow off and put the bucket back on we turn the piles on a regular basis. Early in the winter when we get our first few snowfalls the piles melt really quickly and you can see the steam rising out of them. We know they are doing their thing. Unfortunately for us we do not have a lot of green material to go into the pile. 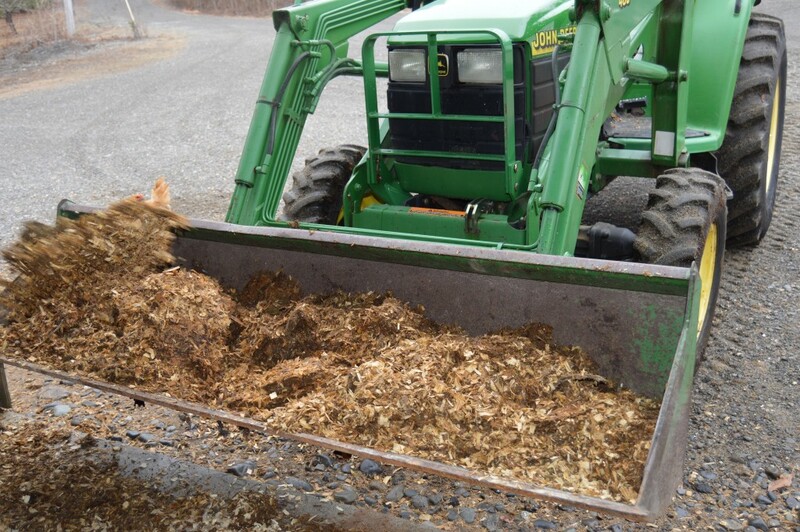 It is mostly shavings and manure which means that it does not break down as fast as it might. There is usually plenty that is ready to go from several years back when the spring comes and I want to put some around the fruit trees and again in the fall when I put it on the garden as it is put to bed for the winter. I did take advantage of last Sunday afternoon to can some beans and pea soup. We had one of our hams for Easter so I used the bone and some of the leftover meat to make a pea soup. It is so convenient to have soup on the shelf if you need a quick lunch or dinner. I know on days when I'm working but my hubby is off he likes to have soup for his lunch. Besides the pea soup I also canned some black beans and ranch beans. The black beans were just plain and we use them for tortilla soup, nachos and any thing else that they work for including salads. The ranch beans are pinto beans with spices in them. Chili powder, cumin, etc which makes them great as a side dish to almost any meat from the barbeque. In fact I think we will have some tonight with the steak we are planning on having. Yes, we splurged and bought some beef from a local farmer. It is the one thing that we do not raise but enjoy once in awhile. 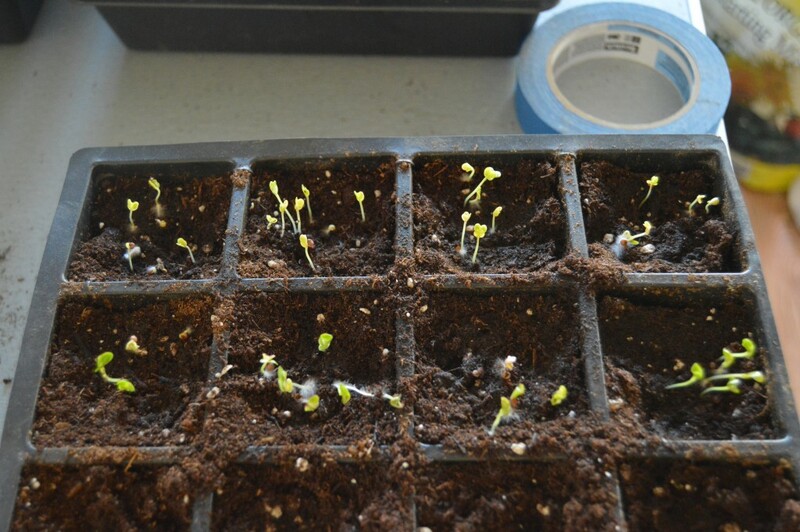 Here is a sneak peek at my seedlings. I got then started about 10 days later than I would have liked to but we had a family funeral and time just got away. These are the broccoli and cabbage. I'll thin them in a few days. These should be able to go out into the garden as soon as I can work the soil a little. They don't mind cool weather. I'm hoping that I can harvest before it gets too warm then I'll be able to plant something else in their place. I have started several types of peppers so I need to get out and get the greenhouse set up for them. Hopefully there will be a pepper harvest on the homestead this year. We use a lot of pickled jalapenos and I am looking forward to canning our own. Here is one more sign of spring here in Maine. 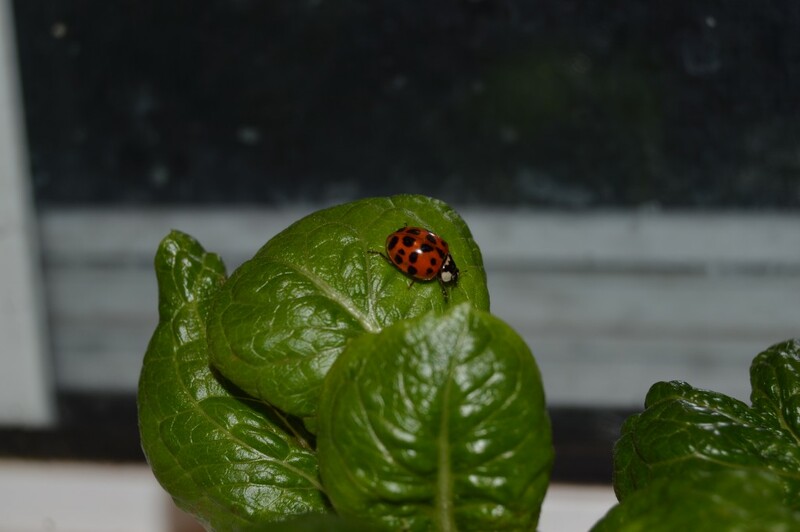 The lady bugs are in the house. So far it has only been a few but some years there are so many that you have to vacuum them up. The maple syrup season here in Maine is underway. Well, some people actually tapped their trees as early as the end of January, early February this year. It has been a very different winter throughout the country and we are no exception. We never had any really cold temperatures. There were a few nights below zero but those came and went rather quickly. So, I looked at the forecast and it looked like we were in for a streak of below freezing temperatures at night and 40-50 during the day. This is perfect sap weather. I came home from work and tapped the trees. By the time I was finished I was using the headlamp to see but you have to do things when you can. My dear husband was off work the next day and he got the cooker set up. Right now we are using a propane outdoor cook stove that we got on sale at Cabala's a couple years ago. Eventually I want to build a rocket stove system to do this. We have so much small twigs and other wood scraps around here that I could boil the sap without paying for fuel. For now though this is the easiest for us to manage. 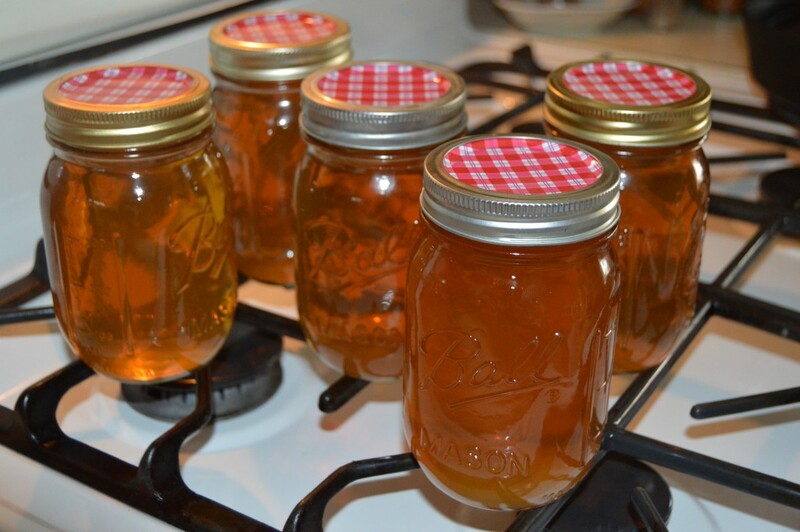 I get the sap boiled down to almost ready to put up and then I bring it into the house to finish. We are not a fancy operation and I don't have a hydrometer (measures the amount of water in the sap) but I probably should invest in one. I just go on the color and taste to determine if the syrup is ready to bottle. We don't actually like it too think or too dark so ours is probably bottled a little earlier than the big guys who try to be very consistent with their product. Ours is only for our personal use and it is what we like. The biggest reason we like it a little thinner is that it soaks into the waffles and pancakes much better. We also get more since we are not boiling it down as much. I have a total of 11 taps in this year. This is the most that I have done but having the outdoor cooker will make this possible. I could have tapped many more due to the fact that there is no snow on the ground. This makes it much easier to get to the maple trees that are around the house. Every tap that we have is out and I guess I need to buy some more. We do it the old fashioned way with taps and jugs hanging on the taps. Many producers use a tubing system which works really well and if set up correctly will direct all the sap into one very large collection container which makes picking up the sap for transport back to the sugar house very easy for them. Some small producers use the tubing in a different way. They tap and just run a length of tubing from the tap into a five gallon bucket that sits at the base of the tree. 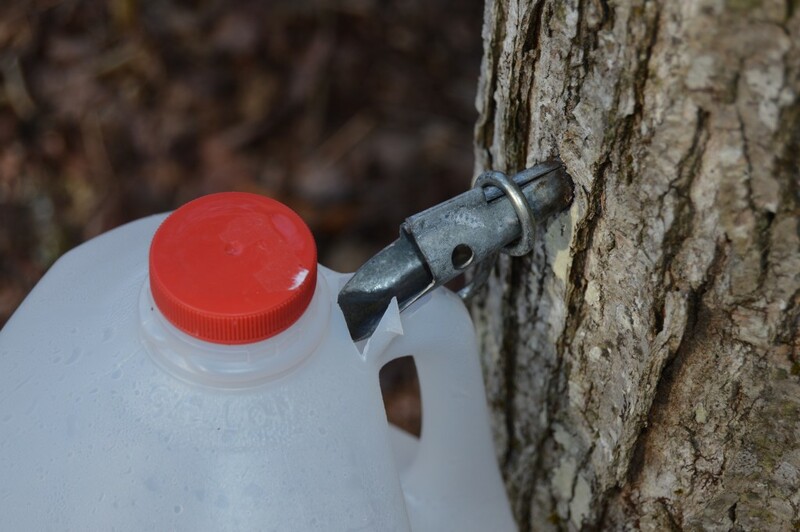 Since I use one gallon jugs it means that I need to collect at least twice a day when the sap is really running so that my jugs aren't overflowing and the precious sap is landing on the ground. Having a five gallon collection bucket allows for once a day collection. I have a lot of gallon jugs and not many five gallon ones so for now we will continue to collect twice a day. 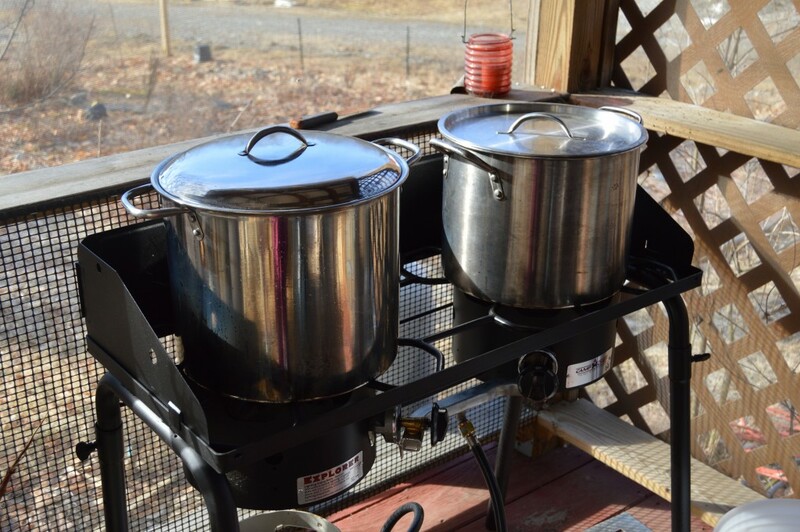 Making maple syrup is not hard work but you cannot neglect it. The season is relatively short and like most things on the homestead, it is so worth it. Well, you know spring is in the air, even if it is 10 degrees outside, when the hatchery catalog arrives. 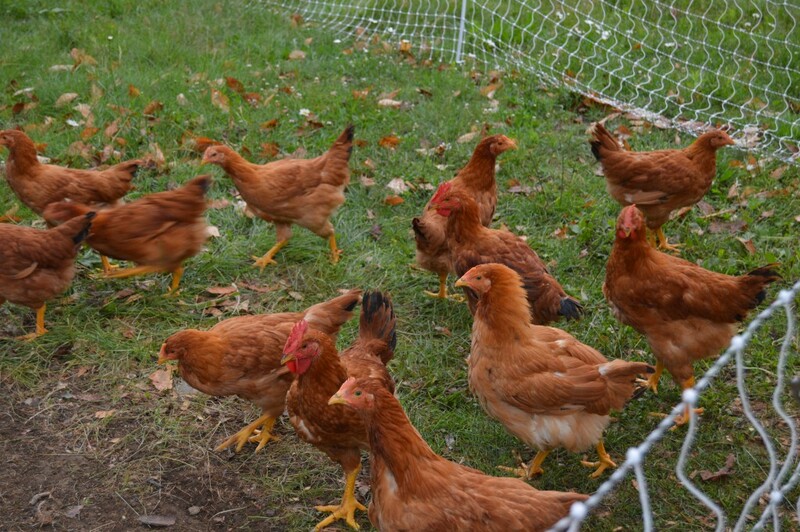 We order our layers and meat birds as day old chicks from Hoover's Hatchery in Iowa. They are mailed to us the day that they are hatched and arrive a couple of days later. There is nothing like getting the phone call from the post office at around 6:30 in the morning asking you to come pick up your peeping box. Chicks are hatched with reserve nutrition stores so they don't have any problem surviving for a day or two without food. The first thing though is to get them a drink of water after their trip. I do this by dipping each chicks beak into the water when I am putting them into the brooder from their travel box. We get the brooder ready the week before they are due to arrive. The brooder is a simulation of what the momma chicken would do for the chicks. The biggest part being keeping them warm. 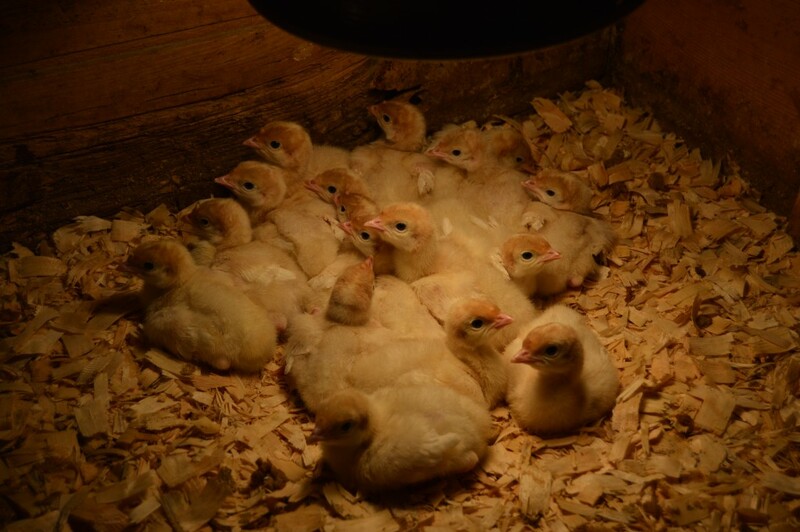 Chicks need a very warm environment for the first few weeks. We accomplish this with a closed box and heat lamps. The new babies actually like it 90-95 degrees for their first week. You can lower the temperature at the floor by 5 degrees each week until is is around 75 degrees. This is accomplished by raising the light farther from the chicks. We do provide the chicks with a starter food that is medicated. This is the only time we give any medicated food to our chickens. We have chosen to do this due to the stress of travel and the fact that we want to keep all disease off our homestead if at all possible. It also helps to start the chicks out with a little boost. After that we feed nothing medicated. After the chicks develop their regular feathers they are put down on the floor of the barn. For about a week or so we still provide them with the heat lamp if they feel they want to get warm they will gather under the light. The arrival time of the chicks is based on a couple of things. Since we have our baby layers and broilers arrive together part of the timing is when we want to butcher. Since we have started raising the Red Rangers it takes 10-12 weeks until they are ready for butchering so that is taken into consideration. We like to have them in the freezer before summer is done. Layers also take 20-24 weeks before they start laying. This will mean that they will have a couple of months before the cold starts to set in to get the laying routine down. You need to plan all this also since it takes around 21 days for chicks to hatch so that you give enough lead time to the hatchery to be able to have chicks hatched when you want them. This year I have ordered two breeds of laying hens that I haven't ever had before, the Golden Lace Wyandotte and the Silver Laced Wyandotte. Both are supposed to be very cold hardy and that is important where we live. I'll have pictures for you when they arrive in early May. Raising chickens is fun and very rewarding in both eggs and meat. We like to know what we are eating and when we are able to know what our birds are eating and how they are processed it makes all the difference in the world. It is not too difficult to get started and so worth it. Whether you homestead or not eventually you will deal with predators and varmints. In the cities there are issues with mice, rats, roaches etc. Here in the country ours tend to be a little bigger. Almost every night, especially during the summer, we hear coyotes howling. Our German Shepard hates the coyotes. She seems to know when they are getting a little too close to the homestead and she answers back to their howls and they seem to move off. Having dogs can be a real deterrent to predators. We have dealt with some sort of weasel in our barn a few years ago. It killed several chickens all in one night and then was gone. This last week we had something that returned for three straight nights. Only my laying hens are kept on the homestead throughout the winter here in Maine. The poor girls were defenseless against this predator. It always came during the night when chickens really cannot see. It killed the chickens that were on the ground and just left them although sometimes took the head because there was no way it would get a body out of a small opening in the chicken pen. There had been an infestation of rats in the barn about 5 years ago and they had chewed a couple of holes at the base of the walls of the barn. By the way the vitamin D pellets by D Con is what finally worked for getting rid of the rats. After the first night I want around covering these entry points with heavy objects to block then. This predator was very strong. I discovered the place it was coming and where it had moved the rock that I had placed over the hole. What we did discover is that we need to have small game traps as part of our homestead. Fortunately for us we have a friend who lent some to us. Since we knew where it was coming into the barn we set two traps up by the entrance and two more in places that we thought it might be entering the chicken pen. We set them up late in the evening baiting them with liver. Our trapper friend said it was probably a member of the weasel family based on what it was doing to the chickens and they like blood. At 3:30 in the morning we once again hear the uproar in the barn. We jump into our clothes and head out. Three more chickens dead and nothing in the traps. 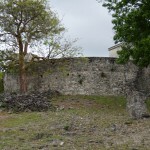 The rock over the entrance had been moved but neither of those traps were disturbed. Very disappointing. We clean things up, turn the light on for the girls and head back to bed trying to figure out what to do next. Regretting what I might find I head out for the regular morning routine at about 6:45. Whew, no more dead chickens. I feed them and fill the water. 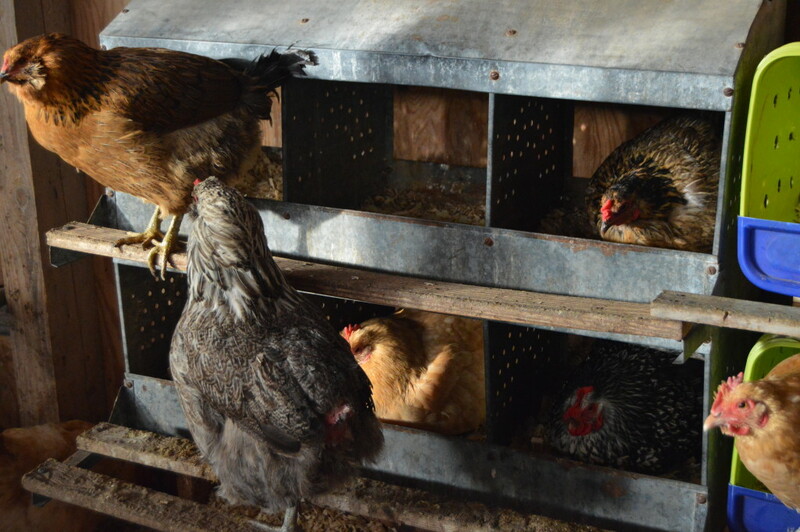 All the chickens have crammed themselves into the nesting boxes to be up off the ground. I decide to check the hole again. 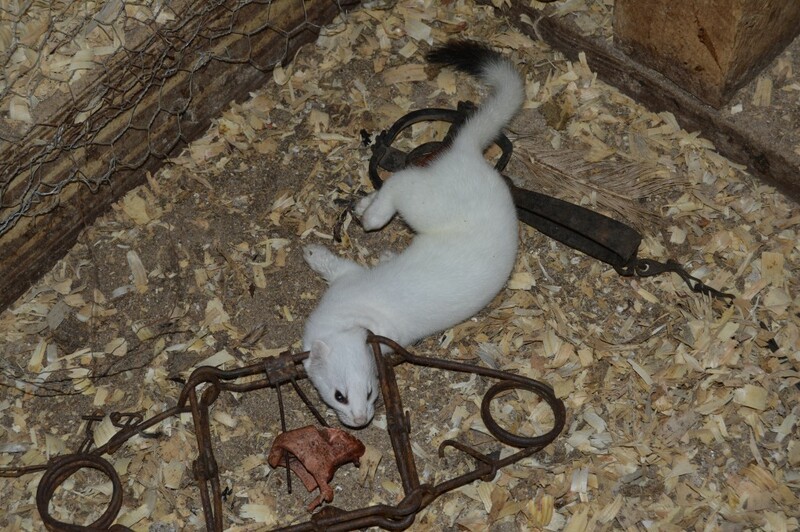 What was in the trap was a ermine or a weasel with it's white winter coat. It is really a beautiful creature. An ermine in it's winter white coat. The traps will be left for a few more days just in case there is more than the one. It is never a joy when you have to take a creatures life but as a homesteader I am responsible for protecting my livestock and when it comes to predators it usually is them or the livestock. Once a predator finds what it perceives as easy pray it will continue to return for more until eliminated. Today is work day in the barn. Despite temperatures hovering around zero I will be out cutting boards and screwing them securely onto all the openings that I have found this week to make the barn as predator proof as possible. It will take several days before the rest of the flock feel they are safe and return to their normal rhythm of life. This event has eliminated around a third of our flock. After fixing the holes time to look at the hatchery catalog. Perfect winter afternoon activity.